Is it just me or have printers gone down in price? 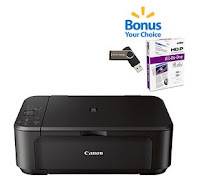 Walmart is offering this Canon All-in-One Inkjet Printer/Scanner/Copier for just $30. I'd say this is a basic printer at a (very) cheap price, but it's also a scanner and copier. I mean, replacement ink cartridges are about the price of this new device. As an added bonus Walmart is tossing in your pick of either office paper or a USB flash drive. Click here to view the deal at Walmart.